Hawthorn has a normalizing effect upon the heart, improving cellular metabolism while strengthening the heart's contractions, thereby improving the rate of blood flow throughout the body. It also helps maintain the integrity of the venal and arterial walls, as well as exhibiting anti-inflammatory and anti-oxidant properties. 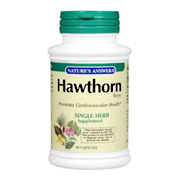 Hawthorn is without a doubt the best long term heart tonic, useful for a variety of imbalances and for maintaining overall cardio-vascular health. As a dietary supplement take three capsules, three times a day preferably with a meal. Hawthorn Berry is shipped in a discrete, unmarked package. Orders are processed immediately and usually take about 3 to 5 working days to be received. We do ask that you try it for 2 to 3 weeks to feel the full effects. Any information received is used only for order processing and shipping purposes. Your information, such as e-mail address, will never be disclosed to a third party.